System not only integrates and collect data from the line Integrated Supervisory Control System (ISCS), Automatic Train Signalling (ATS), (ACC), Passanger Information System (PIS), Close-Circuit Television (CCTV), and also other system interface collecting real-time data and historical data but real time and historical data points as well. It also encompasses large collection of graphic design of stations buildings, various electrical and mechanical system design, design drawings and biography, also storing huge amounts of station video data. Through the real-time data collection of system line via ISCS, ATS, ACC, PIS, CCTV and other data processing systems integration, the ability to achieve real-time control of train operation such as control power supply, provision of environmental control facilities and passenger traffic flow information that aids decision-making for the command center. 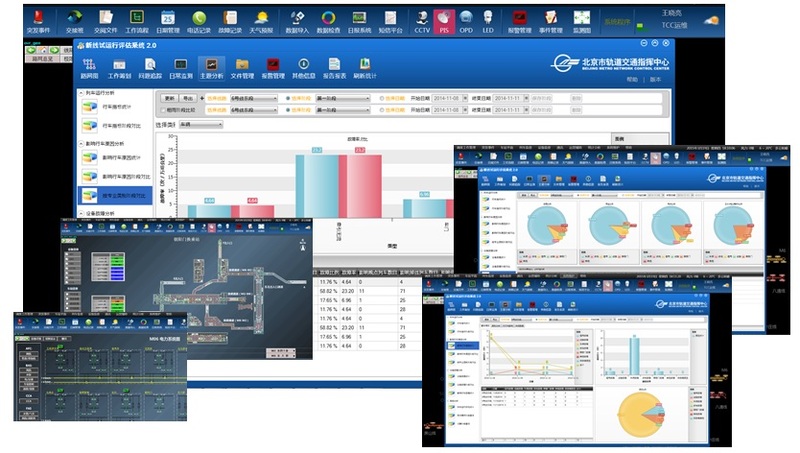 The system provides a series of business functions that is necessary for the command center to function properly, mainly showprojecting the daily scheduled work content in details and with the standard operation process controlled electronically using fast and efficient system interaction interface. This will then increase personnel’s work efficiency and improves accuracy of work completion each day. Solution also include the setup of alert management system, emergency response and joint management information group management capabilities, combined with various types of real-time information and network-based information systems acquisition, which greatly improves the ability to deal with unexpected events, in conjunction with emergency notification systems and passenger information systems, it will alert and report the emergency situation to the relevant party which will then disseminate the information to the travelling public. With the integration of passenger and travel data, the system is able to calculate each network rail route traffic flow in any time interval; hence, it will be able to carry out a comprehensive analysis of transport network capacity. In turn, it will facilitate the development of the whole road network transport organization plan, capacity allocation and adjustment programs to improve the road network transport capacity and coordination network operations management quality.